What a day! I woke up with feeling the boat moving up and down, and after I got up with Teak she became sick. Yup, first time sea sick on the new boat. The wind was blowing and the wave action was not like the day before. The plan was to go over to Mackinac Island with Barry before renting our cars on Friday, June 22nd. I could not leave Teak with the boat bouncing around all day so Josh and I decided we would go over when we get back from our trip home. We spent the day walking around looking at all the shops around the marina. Teak got lots of land time! This blog is a chronicle of the travels of Last Trade. It's our way of sharing our love of the water and boating with you. Over the past thirty years (as members of TMCA - the Texas Mariners Cruising Association), we have participated in and led many cruises along the Texas and Louisiana Gulf coasts. From 1989 to 1993 , our cruising was on our HUNTER 31 sloop named "Profit Taken". In 1993 we bought our ENDEAVOUR 42 sloop "Last Trade" and in 2004 we "crossed over to the dark side" and purchased our 1999 HERITAGE EAST trawler (also named Last Trade - name continuity!) 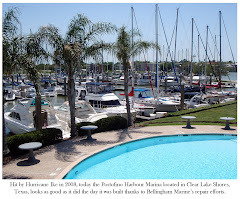 to travel the Gulf Intracoastal Waterway from Texas to Florida and explore the rivers and bayous. For the past year and a half we have been looking for a larger cruising boat. After a trip to the Chesapeake Bay area, three trips to Florida to see numerous boats, and many hours on Yachtworld with little success, Barb found the perfect one on Lake Ontario! We are now the proud owners of a DeFever 45 Pilothouse (still Last Trade!) currently located in Canada. This spring we will begin the adventure of a lifetime - the trip back home! Please enjoy our photos and commentary and let your imagination travel with us. Let us hear your comments! We have been married almost 27 years. Barb retired in 2000 from Bechtel, Inc. and Josh retired in 2009 after 35 years as a Financial Advisor. He is still doing some "fun" work as a FINRA Securities Arbitrator. We have two boys - a 39 year old, Mike, who is in the banking industry and a 23 year old son, Daniel, who has been cruising with us since he was less than one year old. Daniel is now out of college and on his own in the working world so we now have the time to live our dreams! 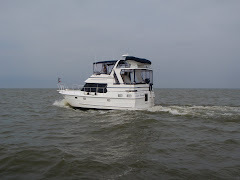 Our plans included cruising the Gulf Coast ICW, and the rivers (Tenn-Tom, and Tennessee River). With our most recent purchase, our plans now include the Trent-Severn Waterway, Georgian Bay, Lake Michigan, the Illinois river, Mississippi river and south to Mobile Bay. We've owned: Sunfish (2), Laser, Catalina 14.2, Vagabond 17, Glasstream 18, Boston Whaler, Robalo, Starwind 22, Hunter 31, Endeavour 42, Heritage East 36 and now a DeFever 45 Pilothouse, numerous dinghies, 2 kayaks and one pedal boat... Think we like the water and boating?